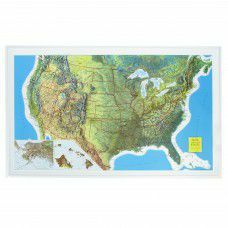 The "Rand McNally" style Geophysical USA Raised Relief is done at a scale of 1" = ~100 miles. The state borders are more prominently outlined in red. Railroad routes are shown. Alaska and Hawaii appear as insets in the lower left hand corner of the map.